An important composer for the American musical theater from the early ’60s, Kander studied music as a child, continued at college, and was determined to make his way in the musical theater. He had some successes in the early ’50s with various lyricists before meeting Fred Ebb (b. April 8, 1932, New York, USA) in 1962. Ebb had already dabbled with lyric writing, and had collaborated with Jerry Herman on some songs for the short-lived musical “A to Z” (1960). Among Kander and Ebb’s first efforts were “My Coloring Book” and “I Don’t Care Much,” both of which were recorded by Barbra Streisand. The new team made their Broadway debut in 1965 with the score for “Flora, the Red Menace,” which included an eye-catching, Tony Award-winning performance by Liza Minnelli, who would subsequently perform much of their work, and become indelibly associated with them. In 1991 they were inducted into the New York Theater Hall of Fame. 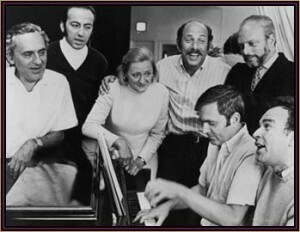 Although “Flora” was relatively unsuccessful, Kander and Ebb were invited to write the score for “Cabaret” (1966), which starred Joel Grey and Jill Haworth, and won seven Tony Awards, including best score.They wrote two additional songs, “Money, Money” and “Mein Herr,” for the 1972 film version, in which Liza Minnelli gave a sensational performance and won an Oscar. The television special produced by Ebb for Minnelli, LIZA WITH A Z, also won an Emmy award, with a Grammy later going to the recorded highlights album. Ebb’s television work continued with the production of OL’ BLUE EYES IS BACK (1972) for Frank Sinatra. Fred Ebb and John Kander entertaining friends. Other Broadway shows followed, including “The Happy Time,” “Zorba,” “70,” “Girls,” and “Chicago,” which opened in 1975 and ran for 923 performances. In the same year, the duo wrote some songs for the film FUNNY LADY, which starred Barbra Streisand, and followed this with music for two Minnelli films, A MATTER OF TIME (1976) and NEW YORK, NEW YORK (1977). The theme from the latter became an enormous, enduring hit for Frank Sinatra in 1980. Back on Broadway, Kander and Ebb wrote scores for “The Act” (1977) with Minnelli, “Woman of the Year” (1981), which starred Lauren Bacall, and “The Rink” (1984), yet another Minnelli (and Chita Rivera) vehicle. In 1991 they were inducted into the New York Theater Hall of Fame, and a revue, “And the World Goes ‘Round,” which celebrated some 30 of their songs, opened Off Broadway and ran for nearly a year. Another musical anthology, “Sing Happy,” played on the London Fringe in the following year. In 1993 their spectacular musical “Kiss of the Spider Woman,” starring Chita Rivera, won several Tony Awards in New York following its transfer from the West End. During the 1996-97 Broadway season, a superb concert version of the 20-year-old “Chicago” won six Tonys, while “Steel Pier,” a new Kander and Ebb musical about a dance marathon held in Atlantic City in 1933 at the height of the depression, failed to convert any of its 11 nominations, and closed after only two months. In 1996, the songwriters were among the recipients of the Stage Directors & Choreographers Foundation’s 12th annual Mr. Abbott Awards. It was an appropriate gesture, because George Abbott directed Kander and Ebb’s first Broadway musical, “Flora, the Red Menace.” The two men were also recipients of Kennedy Center Honors in 1998.Apart from their work together, both Kander and Ebb have enjoyed successful independent careers. Kander has written music for film soundtracks, including KRAMER VS. KRAMER (1980), and Ebb has continued to produce and co-produce numerous television specials, including GYPSY IN MY SOUL (1976) and BARYSHNIKOV ON BROADWAY (1980). COLORED LIGHTS: FORTY YEARS OF WORDS AND MUSIC, John Kander and Fred Ebb with Greg Lawrence. 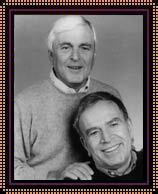 SHOW BIZ, COLLABORATION, AND ALL THAT JAZZ, John Kander and Fred Ebb with Greg Lawrence.